Link between student visa policies and the incentives created for education service providers particularly in relation to quality. In other words, it will look at whether universities, TAFEs and other training providers are rorting the system by enrolling lots of overseas students in dubious courses, knowing that many of the students simply want to get into Australia and don’t really care too much about course quality. Anecdotal evidence on this issue is pretty strong and I recall allegations of dubious practices made against one Queensland university a few years ago (see Foreign students ‘don’t pay to pass’). 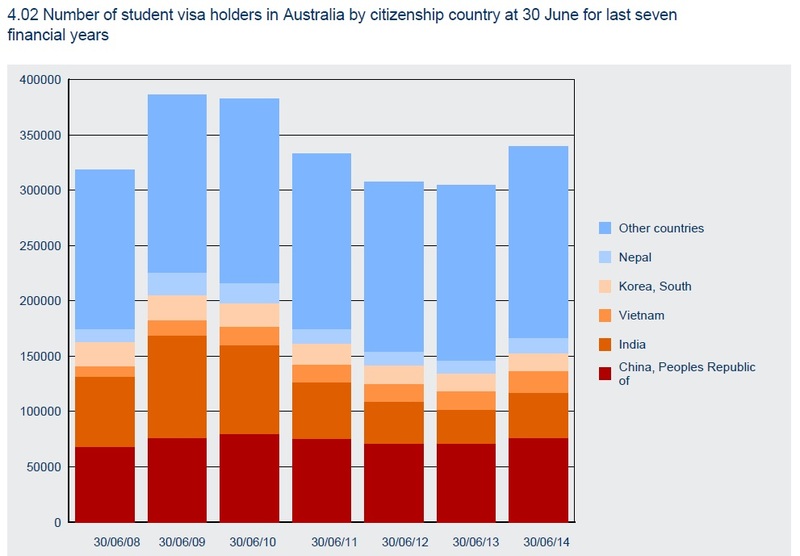 This research project by the Commission is timely, given that international student numbers appear to be recovering after the post-financial crisis slump (see chart below I’ve copied and pasted from an Immigration Department report available from the student visa statistics site), and we’d like to consolidate these gains. This entry was posted in Education and tagged australia, education, highereducation, pc, productivitycommission, studentvisas, training, VET. Bookmark the permalink.